The impressive ceremony was framed by numerous official guests and greetings. Speakers included Stephan Liu (CEO, SinoSwiss Technopark), Frank Eggmann (Consul-General, Swiss Consulate in Chengdu), Tang Zongwei (Executive Deputy Director General, Liangjiang New Area Administrative Committee ) and Thomas Wagner (Honorary President, China Association & former Mayor, Zurich). The project is a core part of Chongqing’s engagement with a range of far reaching national policies such including Made In China 2025, the ambitious strategy to upgrade Chinese manufacturing and services, as well as local and national policies that aim to grow the Liangjiang New Area into one of the country’s foremost hubs for high tech manufacturing, services, and trade. 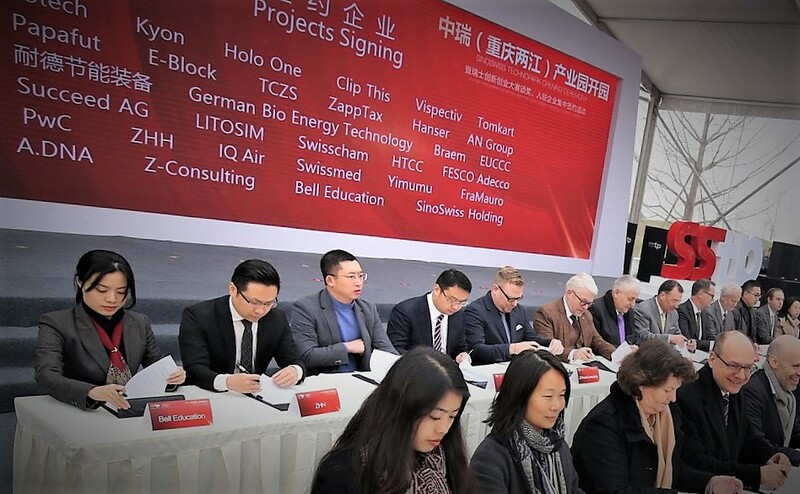 Although a Swiss and Chinese led project, the park aims to be a home to global companies, especially high-tech SMEs. It is also set to become a major centre for the local incubation of joint ventures with the potential to see massive growth in the Chinese market (Source: Press release SinoSwiss Technopark). Z-PUNKT CONSULTING is delighted that the SinoSwiss Technopark is now part of our FAR EAST HUB Business Park portfolio. We are confident that this will create exciting opportunities for some of our European customers.